We are the manufacturer of resin graphite pipes/tubes for heat exchangers. Now we have big promotions /discount for graphite pipes with size D32/22mm, length could be 1000-6000mm; D 38/25mm, length: 1000-6000mm; Other to be confirm. Our company can produce graphite pipes | graphite tubes for heat exchangers. We have the best product lines which can produce wide range of graphite tubes, graphite blocks, plates for heat exchangers. graphitized in high temperature. 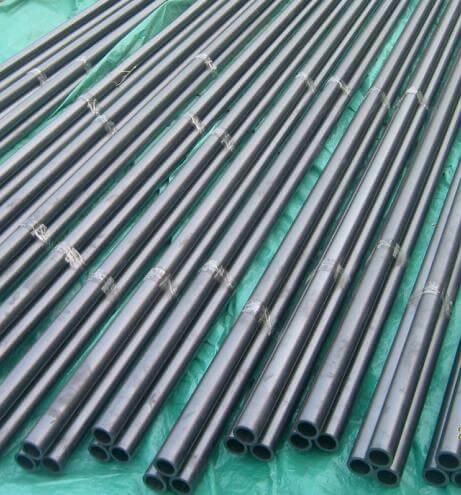 This type of graphite pipes is mainly used for heat exchangers, and can be with bigger length compared to the machined graphite pipes.It can reach a length of 6-7meters max, but the diameter is not big. Resin graphite tube, mainly refers to the phenolic resin extrusion of graphite tube. This graphite tube has the characteristics of graphite, and it has the characteristics of phenolic resin, so it is a perfect combination. It has excellent corrosion resistance and good thermal conductivity.This graphite tubes is mainly used in tube type graphite heat exchanger. In many corrosive materials under the conditions of heat transfer is widely used. The graphite tubes that CFCCARBON LTD produced is with 300 C heat treatment, its thermal conductivity is about 30-40w / (m.k), much higher than other non-metallic anti-corrosive materials, and higher than the stainless steel. Therefore, graphite resin tube has long been quietly step into hydrochloric acid, chlor-alkali industry, and into the chemical industry, pharmaceutical, metallurgy, electroplating, printing and dyeing, paper, environmental protection and other industries. Main application: for heat exchangers.